Exhibition organized by the Embassy of the Czech Republic in Dublin in partnership with dlr LexIcon. 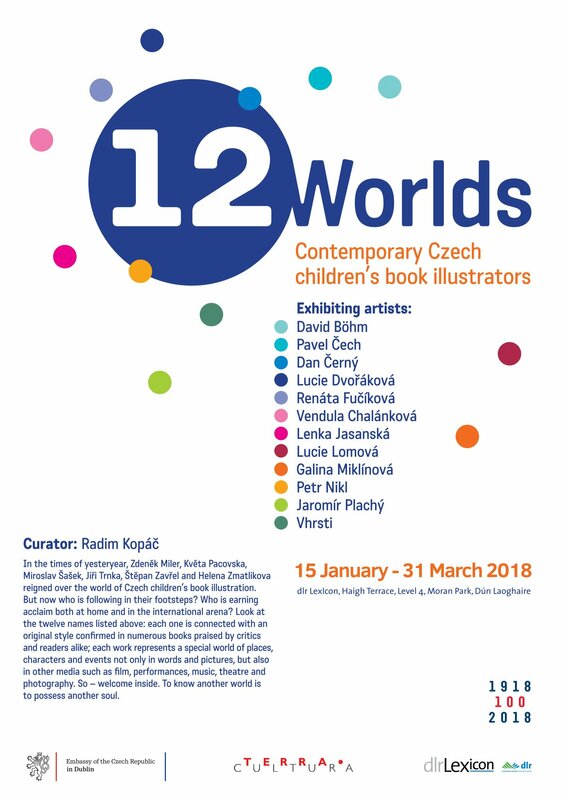 12 Worlds: Contemporary Czech children’s books illustrators is a wonderful new exhibition on Level 4, dlr LexIcon. It was launched by Cllr. Cormac Devlin and the Czech Ambassador to Ireland, Hana Mottlova on 16th January, with a delightful choir of young Czech singers to add to the cultural exchange. Margaret Suggs, Illustrators Ireland and Her Excellency Hana Mottlová, Ambassador of the Czech Republic to Ireland. Petra Miletinova, Her Excellency Hana Mottlová, Ambassador of the Czech Republic to Ireland, and Katerina Garcia. Councillor Cormac Devlin and attendees at the launch of 12 Worlds: Contemporary Czech children's book illustrators. Kristina Tisonova from Shankill and Pavla Smidova from Dalkey. Roger and Alice Childs with Her Excellency Hana Mottlová, Ambassador of the Czech Republic to Ireland (centre). 12 Worlds: Contemporary Czech children's book illustrators. Her Excellency Hana Mottlova, Czech Ambassador to Ireland. Councillor Cormac Devlin, Her Excellency Hana Mottlová, Ambassador of the Czech Republic to Ireland, and Senator Gerry Horkan. The exhibition is curated by Radim Kopáč and features 12 exciting contemporary illustrators. Czech children’s book illustration has a rich and enviable legacy with the very first picturebook for children in Europe produced by the Czech educator Comenius in the 17th century! Illustrators such as Zdeněk Miler (of Mole fame) and Jiří Trnka in the twentieth century have achieved worldwide acclaim but 12 Worlds showcases the unique world perspectives of 12 contemporary Czech children’s book illustrators, all highly regarded and already accumulating awards and accolades. The illustrations on display come from a variety of media – not only books but comics, film, theatre performance, music and photography. The variety of styles by the 12 artists is striking – so whether you enjoy minimalism or monsters (the terrifying Oddsockeater! ), caricatures or cartoons, fun, flair, fantasy and dreams – there is a ‘World’ for everyone in this intriguing exhibition which continues at dlr LexIcon until 31 March 2018. Over the last 4 years, dlr LexIcon has enjoyed close cultural exchange with the Embassy of the Czech Republic in Dublin. The exhibition on the life and times of the Czech writer Karel Čapek was held in 2015, followed by a series of jazz evenings with the renowned Czech/Irish group ON/Off Quartet in 2016 and in 2017 audiences enjoyed A Musical Voyage – an evening of musical traditions from the Eastern Mediterranean to the coast of Ireland with Katerina García, Síle Denvir and Robert Harvey. Our thanks to the Czech Ambassador to Ireland, Hana Mottlova for all that she has done to enrich our cultural programme at dlr LexIcon with her vibrant and varied selection of events and partnerships. ‘I believe that people live in the world they want to live in. If you look out at the world with joy, joy will be returned to you. It sounds like a cliché, but it works perfectly’. Vhrsti.